Thanks to a telephone call from Ron Iversen of Mendocino we have a solution to our latest ‘History Mystery!’ All but one of the students shown in the ca. 1945 photograph of teacher and principal, Alma Mendosa, on the steps of the Manchester School were identified. Of course he knew them because he is in the photograph–the boy on the right, crouching in the first row. From left to right, first row, we have an as yet unidentified boy, then Michael Keyes (spelling of last name uncertain), then Walter (Ron) Iversen. In the second row, standing with Mrs. Mendosa, from left to right are Don Coughey (last name spelling uncertain), Patsy Titus, Rosie Giacomini and Charles Cabassi. Charles and Ron are still friends and Ron gave us his phone number. We emailed him the photo and he was able to add to the information Ron provided. As is so often the case, our solutions led to further mysteries. Even though 1945 is not that long ago, it is difficult to trace some of Mr. Iversen’s classmates. Don Coughey (or Cowie or Coue– all three family names have histories in Mendocino County, according to online sources) is still a mystery. 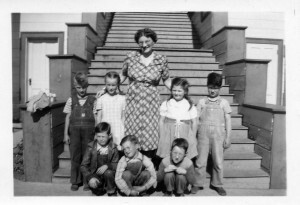 Patsy Anne Titus’ family was living in Point Arena, according to the 1940 census. Her father was Stanley Titus, mother Barbara Bentley Titus. Patsy was born in Napa County, on May 29, 1938. At the age of 18, she married John L. Potter, on February 17, 1957. The only other girl in this class, Rose Giacomini, had a birthday just three days before Patsy’s. Rose was born to Romeo Giacomini and Rena Scaramella Giacomini in Fort Bragg. Again, according to online sources, Rose became a June bride, marrying Thomas H. Mallory in 1957. Rose was living in North Las Vegas, Nevada, when she passed away in January of 1995. Next to Rosie in the photograph is Charles Cabassi. Charles was also born in the spring of 1938, and lived with his parents, John and Iola Moralli Cabassi, in Fort Bragg in 1940. Charles married Sandra J. Loomis of San Luis Obispo County in August of 1959. The bride was nineteen years of age, Charles was twenty-one. In the 1960s, Charles apparently worked as an agent in his in-laws’ insurance agency. He currently lives in Redwood Valley. Before either Rose or Charles were born, Mr. Giacomini and Mr. Cabassi had entered into a working and residential arrangement described in the 1930 federal census. Charles’ father, John Cabassi, was a boarder with the Giacomini family in Point Arena, working in their cheese factory. The household included Rose’s three older siblings: Lester, Gloria and Clarence. In addition to Mr. Cabassi, there were three other boarders: Tom Poncetta, Frank Guenza and Robert Gianoli. Each time we have a name to add to a previously unidentified person in a photograph, that name opens up new avenues for further research into the community of families whose histories are linked to our region. These avenues sometimes lead to ‘dead ends; but some lead to more names, both forward and backward in time. 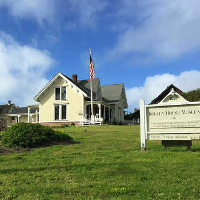 If you think you might enjoy joining us in tracking down these or other leads, please contact the Kelley House Museum to become a volunteer ‘History Detective.’ You may call us at (707) 937-5791 or email curator@kelleyhousemuseum.org. Our thanks go to Ron Iversen, who saw the ‘History Mystery’ a couple of weeks ago, and called the Kelley House!